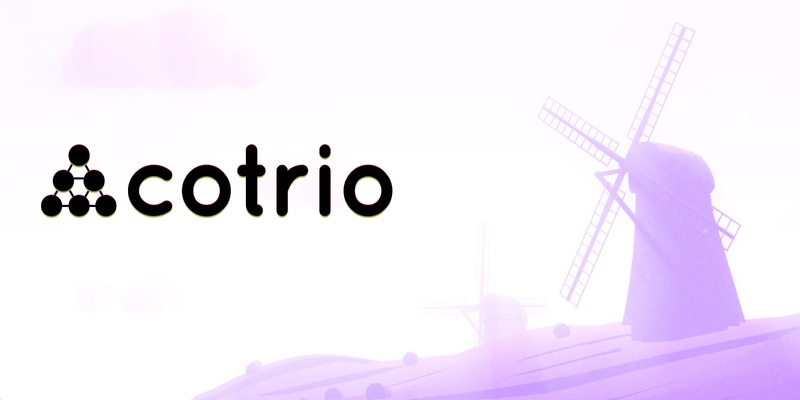 Bartosz Bialek’ Cotrio is a surprisingly stylish game for a math puzzler. The developer tried to make it a relaxing but challenging experience, and I think he achieved that goal. 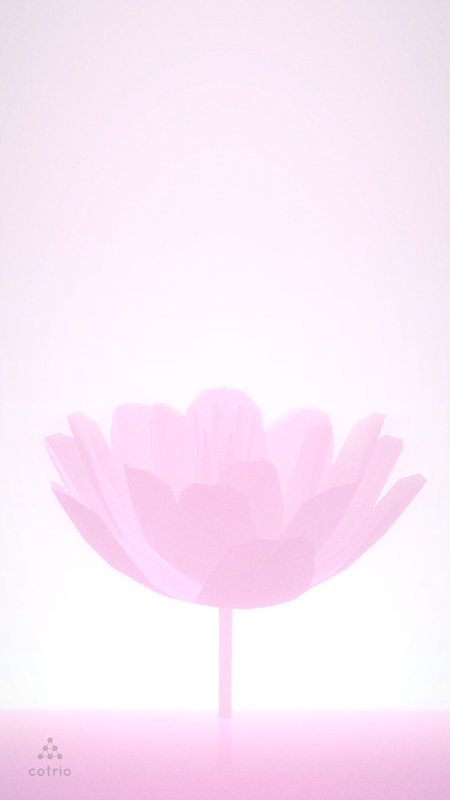 The artwork and animations are minimalistic and remind me of Carl Burton’s Islands with their monochromatic 3D landscapes. Together with a chill soundtrack, the game offers a calming experience despite its challenging puzzles. The way Cotrio works is you’re given six circles, or nodes, set up in a pyramid, connected by a grid. Each level has three numbers at the top that tell you which numbers you can expect to see. For instance, an earlier easy one would have just the numbers 1, 2 and 3. 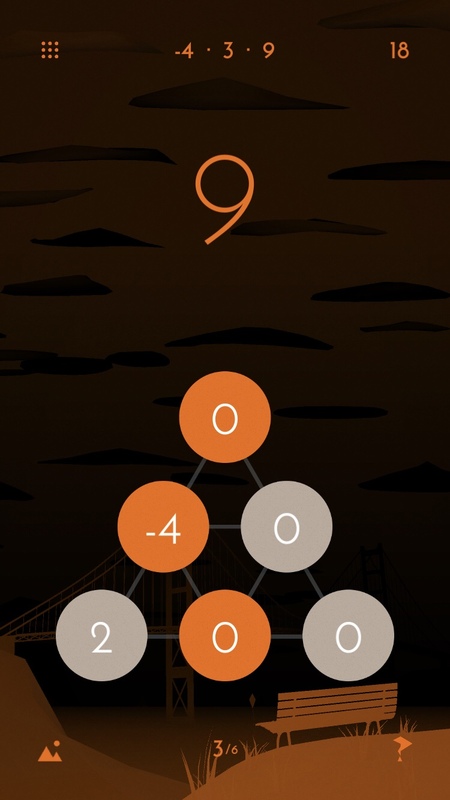 Each move, one of those numbers will randomly appear above the nodes and you have to choose where to place it. The idea is to set the numbers up so that three numbers triangulated would result in a sum. So for instance, if there’s a 1 next to a 2, you can place a 3 on the node connected to both of them and the 3 will absorb the others. The 3’s node will then get colored in and set back to 0. 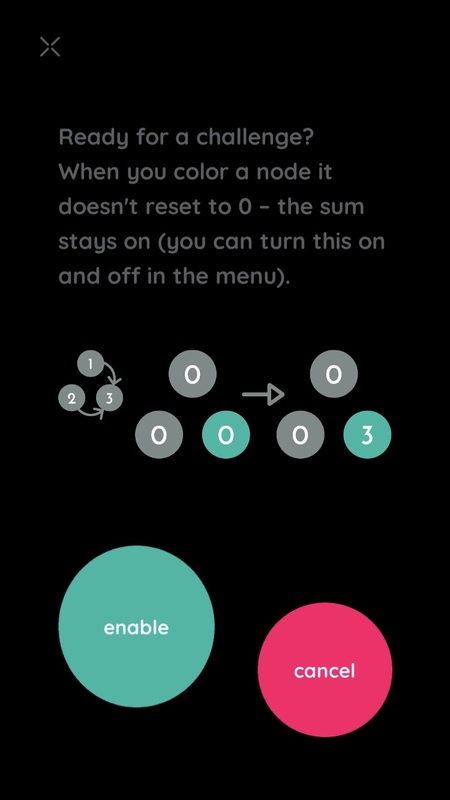 Your goal in each level is to color in all the nodes. More skilled players might be able to set up the board so multiple nodes clear at the same time, especially since the three outer nodes also count as a triangle. There are some rules, though. First off, you can’t have two of the same number next to each other, even for a brief second. If you do, it’s game over and you have to start the level over, no matter how well you were doing. The other catch is that you have only thirty-three moves in which to complete the level. You do get bonus moves for each sum you form, but with more difficult numbers, you can easily run out. The game has a great one-handed feel, as all you need to do is tap the nodes. There’s no complex control scheme to work out and everything is big and clear and easy to read. The playing field is also low down on the screen, so those with short fingers like mine shouldn’t have to reach unless you want to access the menu in the upper left corner. Unfortunately, it does not have iCloud sync at the moment, so I recommend just playing on your iPhone, since it feels designed for that. So far, I’ve completed thirty-five out of eighty levels, and some levels are more frustrating than others because of the numbers you’re given. The difficulty curve is also inconsistent, as I’ve been given easier numbers to work with after some trickier ones. For instance, level 26 gives you -2, 5 and 7. Since -2 + 7 = 5, that’s a fairly easy level. But a few levels earlier at 22, I got 2, 3 and 9. It takes a lot more moves — or some ingenious setups — to get numbers to add up to 9, so I had far more failures with level 22 than with 26. On top of that, you’re at the mercy, to some extent, of the randomly generated numbers. Say you’re doing well and almost completed a level. All you need is a -1, but you keep getting an 8 or a 6. And then you run out of moves. It’s hard to plan for that, because the -1 might be plentiful early on, then all of a sudden stop coming when you need it the most. For those who like the artwork and want to mess around with it and perhaps even take a screenshot to use as an iPhone wallpaper, there’s a photo mode that allows you to zoom in and move the camera around, then take a photo and save it without all the on-screen clutter. There’s also a night mode for those who find the white background too bright, but I should warn you that sometimes works great with the background art and other times the artwork doesn’t show or is too dark to make out well. But if you don’t mind that and find the white too harsh on your eyes, the black is a good option. Cotrio has a lot to offer, but also has some weird design decisions. 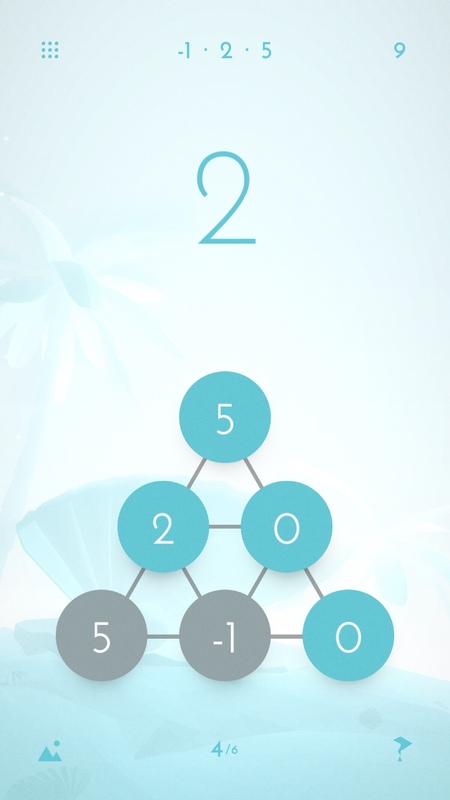 For one, there’s an optional challenge mode for each level that keeps the numbers on the nodes after you clear them, instead of going back down to 0. You can turn this mode on and off whenever you please, but there’s no way to replay a level in the harder mode once you complete it on the regular mode. You me only option is to either play with challenge mode on or complete the game and then start over to play them all on the harder difficulty. It’s a strange design, but the developer did express interest in adding separate save slots for both modes in an update. Another odd quirk is that there’s no quick restart button for when you see the game isn’t going well and you just want to start the level over. You have to intentionally place two of the same number next to each other or run out of moves if you want to restart. It’s not a very user-friendly decision, even if it was done to keep the the layout minimalistic. It’s also not the end of the world, but it is a bit of a time-waster. 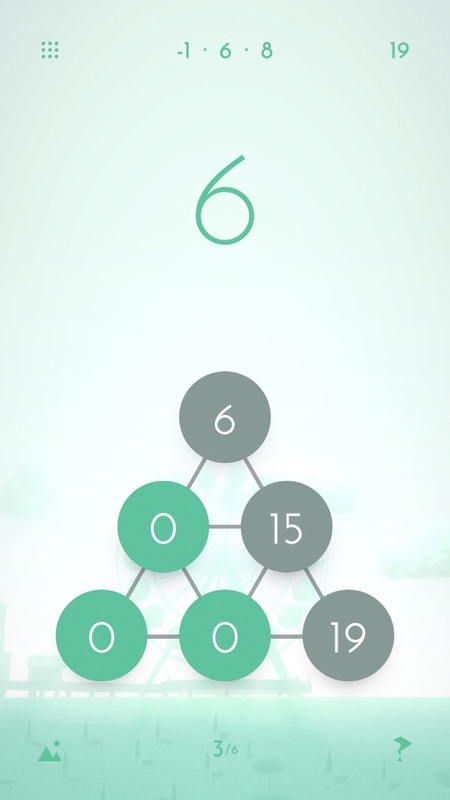 There’s a solid game here in Cotrio, and if you like math puzzlers, you get a lot of bang for your buck. But those who get frustrated by math easily may want to steer clear. As much as I was enjoying it, a set of difficult numbers can make me give up on the game for a while. I’ll probably come back to it every now and then, but it isn’t the kind of game I’m going to spend hours on at a time. It can feel a bit discouraging when the numbers don’t play nice together or things are going well and you get a slew of 8’s when you’re waiting for a -1. Bottom line is, if you have the patience for it, there’s a solid game here that’s worth your time and money. But if you don’t, you may give up on it quickly. If the game sounds like something you’d enjoy, grab it here and get those rusty math skills working again!